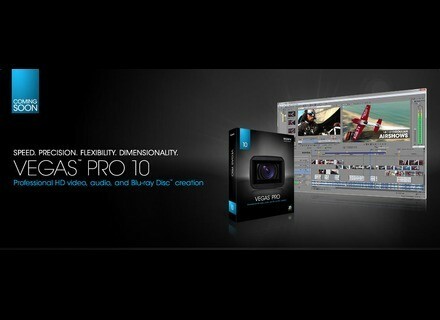 Sony Creative Software has announced Vegas Pro 10 software. The most recent upgrade to Sony's nonlinear HD video and audio editing (NLE) application is designed to provide broad audio and video support for media ingest, editing and delivery workflows for production professionals. New features in the native 32- and 64-bit versions of Vegas Pro 10 include stereoscopic 3D editing tools, enhanced closed captioning features, broadened video effect support and new event level audio effects, as well as workflow and user interface enhancements. These updates enable media creators to produce and deliver ccontent for broadcast and broadband distribution, theatrical releases, YouTube 3D, and prepare content for DVD and 3D Blu-ray titles. Stereoscopic 3D Editing: Vegas Pro 10 facilitates the creation of 3D projects by enabling users to import, adjust, edit, preview and export stereoscopic 3D projects natively without any additional tools or plug-ins. These new features and workflow updates make working in 3D as seamless as working in 2D. While fully compatible with the latest 3D screen technology, anaglyphic viewing is also supported, making it possible to preview 3D on any monitor. Improved Closed Captioning: Improved support for closed captions enables broadcasters to preview captions in the Video Preview and Trimmer windows for increased accuracy and ease of editing. Other improvements include increased support for line 21 closed captions, HD SDI closed captions, multiple closed captioning file types as well as the ability to export captions for Sony DVD Architect, YouTube, RealPlayer, QuickTime, and Windows Media Player. Expanded Multicam Functionality: Updated multicam features provide a more robust editing and preview experience by offering the ability to view the multicam source clips and the full-screen edited program output simultaneously. Improved support for DSLR video: Performance improvements make editing video from popular DSLR cameras faster and easier. Track Grouping: This update offers a quick and easy way to organize and manage complex projects by grouping related sections of video/audio for a cleaner working environment. Advanced Transport Controls: UI modifications offer efficient access to important editing tools, providing a more intuitive workflow while improving overall productivity. Image Stabilization: New stabilization tools greatly reduce jittery or shaky video sometimes caused by hand held recording. Video Plug-in SDK: Video Effects Plug-in Architecture: Vegas Pro 10 now offers a completely new video effects plug-in architecture based on the Open Effects Association standard. This industry-leading standard was created from the combined experience of the leading companies in the visual effects industry. The new architecture is accessed by a new software development kit (SDK), which reduces the developer's workload by automating UI integration. These features will benefit editors by greatly expanding the available visual effects plug-ins available for Vegas Pro 10. Audio Event FX: For more precise control over the placement of audio effects, Vegas Pro 10 allows editors to assign audio effects at the master output, bus level, track level and now at the event level for greater flexibility when working with multitrack projects. Input Busses: Input Busses now enable editors to record, mix and monitor audio from external hardware devices. VU meters: The Vegas Pro Mixing Console view becomes even more powerful with the addition of new VU meters. Track Meters: Track Meters provide direct feedback and a faster editing workflow throughout the record, edit and mix process. GPU Accelerated AVC Encoding: Users with CUDA-enabled nVidia video cards are now able to encode to the Sony AVC format with improved rendering performance and speed. Device Support: Sony continues to add expanded device support with each new version including HD-SDI adapters, Sony NXCAM cameras, and broader support for DVD and Blu-ray Disc drives. Vegas Pro 10 software is scheduled to be available on October 11, 2010 at retailers worldwide and for purchase online at www.sonycreativesoftware.com. Manufacturer's Suggested Retail Price (MSRP) for Vegas Pro 10 software is $699.95. Upgrades from previous versions of Vegas Pro are available for $249.95. Adobe Updates Premiere Pro CS5 Adobe recently updated Premiere Pro CS5 to version 5.0.2. Waves Video Sound Suite Waves turns to video and offers video editors a 6-plugin suite to improve sound and image. Barco RLM-W8 Barco's RLM-W8 is a 8,000 lumens, DLP WUXGA projector, designed to bring the saturated colors of three-chip DLPTM projection to events and fixed installations.